Mt. Kangchenjunga is the 3rd highest peak in the world, but only a handful of intrepid travelers make the trek to the mountain base-camp in remote Nepal. Here’s how you can be one of the lucky few. THE ADVENTURE TOURISM boom has Nepal firmly in its sights, and Kathmandu’s Thamel district overflows with same kind of wall-to-wall tourism industry you’d expect to see on Bangkok’s Khao San Road. Popular treks in the Everest Base Camp region and around the Annapurna Circuit, while as spectacular as ever, are now crowded with travelers. If you’d rather share a cup of sweet tea with a Tibetan refugee than a bottle of beer with another backpacker at the end of each day’s hike, consider a trip to the base camp of the little known third tallest mountain in the world: Mt. Kangchenjunga. Make pre-dawn alpine starts to catch early morning views of 28,169 ft tall Mt. Kangchenjunga. Tucked away in the remote northeast corner of the country, the almost complete lack of tourist infrastructure in the Taplejung district of Nepal makes for an adventure that’s equal parts rugged and rewarding. The 20+ day Kangchenjunga loop trek will have you subsisting on a diet of rice and lentils, sleeping chilly nights in drafty huts, and teetering across bridges you’d probably rather your mother never even imagine. If you make it, though, the pay-offs are huge: You’ll be rewarded with unique insight into Nepali village life by living it from the inside out; you’ll experience every climate Nepal has to offer, from steamy jungles to jumbled glaciers; and if you’re lucky, you’ll make pre-dawn alpine starts to catch early morning views of 28,169 ft tall Mt. Kangchenjunga before the afternoon clouds close in at each of its two base camps. Many independent travelers recoil at the thought of hiring a guide, but the Taplejung district of Nepal is a truly remote corner of the world. Unless you know the Nepali for “I’m sorry to hear the airplane hasn’t been able to land in the fog for 15 days, can you please call your friend in the next village to book me a spot on the bus to Birtamod?” you’re really best off hiring a guide to accompany you from Kathmandu. Find a trekking agency in Kathmandu that’s willing to provide just the basics: a permit, travel arrangements, and a guide who knows the area. Trek Nepal is a Nepali owned and operated outfitter located in the center of Thamel where you’ll always find someone ready to talk about adventure plans over a cup of tea. The Kangchenjunga trekking loop connects just enough tiny villages to make traveling without a tent or cooking gear possible. Along the way, you’ll roll out your sleeping bag on bare wooden beds in basic teahouses frequented by porters or in family homes. 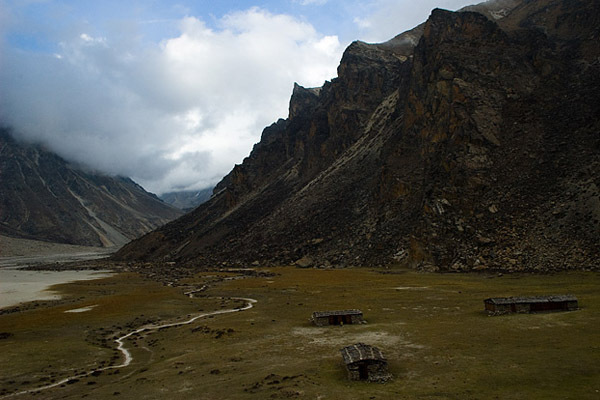 High in the mountains, you’ll spend a few nights in stone huts used seasonally by yak herders. If your guide doesn’t plan ahead, you may find yourself spending the occasional night in a cave. Lunch and dinner on a Kangchenjunga trek will inevitably consist of dal (lentils) with baht (rice). Dinners are often augmented with a side of boiled potatoes or a spinach-like green vegetable. Dal baht can be surprisingly tasty and restorative after a long day of uphill trekking – don’t hesitate to ask for seconds and thirds. Breakfasts generally take the form of some combination of eggs, crispy pan fried chapati, and instant noodle soup. The alcoholic beverage of choice is tongba: a bitter drink made from hot water, fermented corn, rice, and millet and sipped through a straw from what looks like a miniature butter churn. It’s possible to negotiate rates for food and lodging as you go, but you won’t save much and you’ll always be left wondering who came out on top. 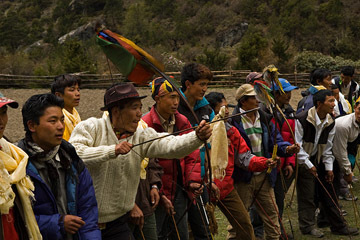 A wiser alternative is to pay a lump sum to the trekking agency to cover food and lodging. This will make it in the guide’s best interest to negotiate fair deals, and it will leave you free to enjoy the trip. Pack light and try to fit everything in a large daypack. Bring a sleeping bag rated to at least 0º F/20º C, a sleeping pad, and warm clothes including a hat and gloves. The key to beating Acute Mountain Sickness (AMS) is to drink lots of water, so each trekker should carry bottles with at least 2 liters of capacity. Safe, boiled water from locals is a good way to fill bottles and make friends, but plan on bringing a few bottles of iodine tablets or a similar treatment option to fill in the gaps. Even with a guide, stay oriented and carry a map. The Himalayan Maphouse publishes an excellent topographic map called ‘Kangchenjunga – Base Camp Trail’ covering the entire area in 1:100,000 scale. Packing a few energy bars from Kathmandu to supply extra calories on particularly strenuous days is a good idea. Finally, load up on medical supplies and know how to use them. If something goes wrong, medical help may be days away. Bring enough basic supplies like band-aids and antibiotic ointment so that you can treat locals you meet along the way. Don’t treat anything out of your depth, but be generous where you can. Fortunately, Nepalis think nothing of taking an overloaded bus down roads that a westerner would think twice about exploring in a 4×4. Taplejung, district capital of Nepal’s Taplejung district, is the closest town to Mt. Kangchenjunga accessible by road or air. Each option – driving or flying – is an adventure in itself. Since you’ll probably visit Taplejung exactly once in your life the best plan is probably to try one on the way in, and the other on the way out. A Royal Nepal Airlines Twin Otter makes two weekly flights from Biratnagar (Nepal’s second largest city) to Suketar (Taplejung’s airport). Flights depart at 7am to beat mountain weather and only hold 18 passengers, so book ahead. The spectacular flight offers views of snow capped Himalayan peaks to the north and ends with a hair-raising landing on an airstrip floating above the clouds. Jovial Nepalis laugh at every turbulent bump which helps ease the tension. Cross your fingers on the takeoff: if the pilot comes up short it’s a 1,000 ft tumble to the valley floor in Taplejung. The paved Mahendra Highway connects Kathmandu with the small transit hub of Birtamod on its way to northeastern India. The paved road north from here to Taplejung goes as far as the tea growing town of Ilam before deteriorating to a rough dirt track. Fortunately, Nepalis think nothing of taking an overloaded bus down roads that a westerner would think twice about exploring in a 4×4. Conditions have a significant effect on travel times, and the Birtamod/Taplejung trip will likely take more than a day. I paid $900 for what ended up being a 21 day trip. Included in that was a Royal Nepal Air ticket from Kathmandu to Biratnagar (USD 91) and from Biratnagar to Suketar (USD 65). The remaining cost breaks out to about $35/day for food, lodging, and guide. It’s a 7 day hike from Suketar (the closest airport) to Ghunsa (the first point where you really start popping out over the tree line). If you’re a mountain seeker looking to get up into alpine territory, a trip shorter than 14 days to this region may not be rewarding. If you’re there for the village life, and don’t mind spending most of your time at the lower jungle elevations it could still be a great spot for a week long trek. There’s a holy shrine to the goddess Pathibhara Devi on a high hilltop within two days walk of Suketar where there’s a Buddhist lamp lighting ceremony on every full moon. Matador’s Nepal expert, Grady, is a documentary film-maker who grew up and went to international school in Kathmandu. Several Nepali NGOs have profiles on Matador, including the Center For Cultural Studies and Volunteering. The extraordinary Everest Peace Project, which brought a team of Israeli and Palestinian mountaineers to the summit of Everest, was recently featured in Matador’s Traverse magazine. Are you thinking of visiting Nepal? Dive into the Matador community and make the connections you need for a life-changing trip.